After our problems at Oregon Trail, we were determined to do well at Olympus. On the first day, we were out early on the first stage after with a mechanical problem. Something with the axle and the diff went horribly wrong on the transit to parc expose and we were that one team working on their car in the driveway of our state capitol. We patched the ol' rabbit back together but couldn't make it through the first stage. Overnight, the boys in service made the rabbit whole again and we were ready for business. Stage 1 was awesome, with a top 3 time. Stage 2 of the day, however, went less spectacularly. This was the famous Nahwatzel stage, in the 26-mile version. We were ready and dedicated to putting down an awesome time. It was slightly rainy (okay, pretty darn rainy) and we made it pretty far into the stage before it got the best of us, not for the last time. The in-car video clearly demonstrates me calling a hard left for my brother, but the distance was unknown and the handy instuction pointer was behind some bushes, and the corner was in a heavily logged area, so there were not trees to read. With all of these things against us, Tom missed the corner and we slid wide into the stumps for our first crash DNF. 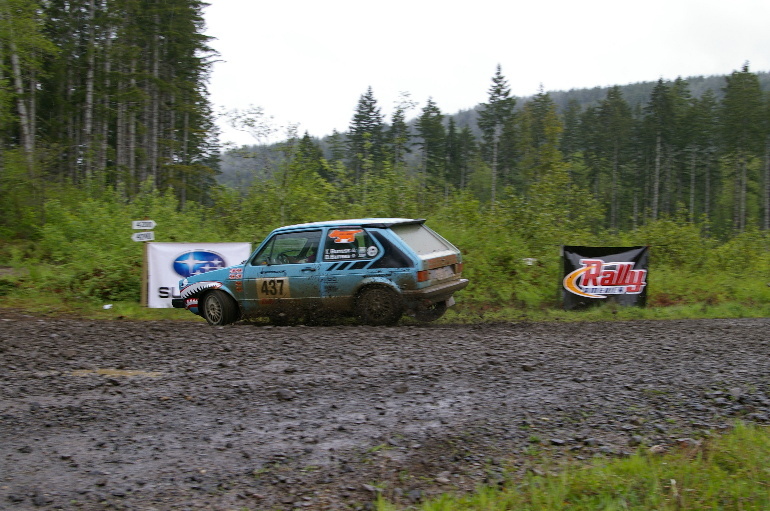 Eventually, we dug and leveraged the car back onto the road, but the front suspension was too damaged to continue, so we waited in the rain for our crew to winch us onto the trailer. Valuable lessons were learned that day and our first serious "off" was finally behind us.